Life is worth more than everything, including political ambitions. But that's not the case in Nigeria. The lives of the masses have no place in Nigerian system. They are hell-bent on killing and maiming the electorates, just to satisfy themselves. 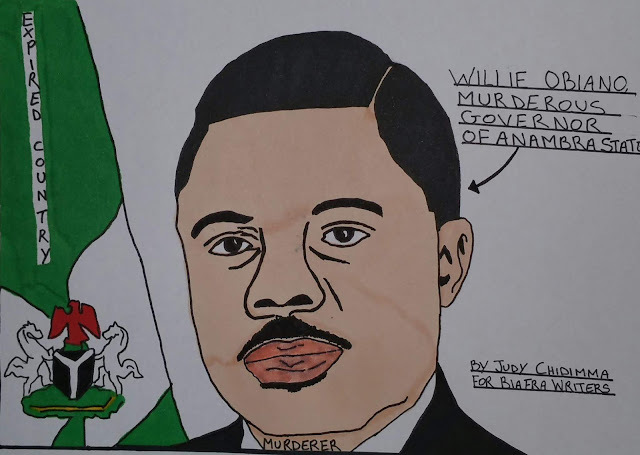 Obiano, the chief security officer of Anambra state, has been killing his subjects both for money, rituals and for unnecessary intimidations. Obiano as an Hausa Fulani slave and political harlot has killed Biafrans in their numbers especially people from Anambra state. It has not been erased from our memories, how he ordered the massacre of IPOB members on the 30th of May 2016 at Nkpor, during a peaceful remembrance ceremony in commemoration of our dead heroes and heroines. Or the Killing at Ozubulu and Onitsha a few days back, which he tagged a drug war between two drug cartels plying their trade in far away South Africa. The state police commissioner, within 2hours, carried out a fire brigade investigation into the killings and came up with a concocted cause of the mayhem as if we are watching Nollywood movie. We know the massacre was a political attempt to silence the Anambra people and intimidate them into voting instead of the proposed boycott come November 18 gubernatorial elections. Under Obiano and the police commissioner Mr.Garba umar’s watch, Some IPOB faithfuls were shot in Anambra state. The lives, which Obiano is supposed to secure he watched being destroyed, just because of his political ambitions. These Biafrans were waiting to welcome their leader but had their wine turned into water, as the combined team of Nigerian army and police from Aguata command shot into the crowd who were harmlessly waiting for their leader’s arrival.These military men didn't put into consideration the children and the women who were in the crowd, they were so banal to do their masters' (Obiano and Garba Umar) wish, that which they had been paid to accomplish. They shot these people without a second thought. Some days back, Obiano deceitfully made vain apologies over the lives of some IPOB members lost in the hands of the trigger happy Hausa Fulani killers in military uniform during their peaceful protest in Anambra state, he accused Buhari of being the mastermind behind those killings. But our question is, Is Buhari also the mastermind behind the recent killings since Buhari has been incapacitated over a long period of time? The IPOB faithfuls didn't subscribe to his vain political promises this time, he then ordered their massacre, in a bid to intimidate them with the military into voting against their proposed boycott of the gubernatorial elections. He killed the people he also swore to secure. Obiano doesn't want the people to discuss Biafra, so he resorted to killing them in other to instil fear in their minds. The recent killings are a strong reason to show that Obiano is a bloodsucker and is behind virtually every killing in Anambra state. He couldn't protect the lives of his subjects, which is one of his political manifestos, so come the election period he won't get their mandate any longer. We are putting the world on notice not because they will come to save us, but because we want them to know of the happenings in Anambra state and Biafra land in general, in case the masses decide to retaliate the killings of their loved ones, because in Igbo it is said " Okuko anaghi eti nkpu ka ihe ji ya hara ya, mana ka oha nuru olu ya". The UN is proving they are biased as they have been silent over the genocide and pogrom going on in Biafraland. These people came to exercise the fundamental right of freedom of association, they gathered as enshrined in Nigeria's constitution, but were wickedly shot at by the blood thirsty Nigerian army. When the time comes, the wantonly treacherous Obiano and Garba Umar will give an account of the lives they destroyed in Anambra state. Come November 18th, 2017, there will be no "ELECTION IN ANAMBRA STATE".